A Public Relations professional declared the annual report dead, to the shock of attendees at the workshop Pathways to Excellence: Excellence in Communications held by the Nonprofit Coordinating Committee (NPCC) on February 23, 2018. A second panelist concurred that it was not helpful for a nonprofit organization to narrate events and programs that had occurred between 12 and 18 months prior to the publication date. I respectfully disagree. For those supporters who have come into the fold, say, in the past three months, the range of activities and successes previously conducted by the nonprofit probably are beyond their horizon. In fact, new supporters may be even more impressed to be brought up to date on the full range of achievements of the prior year. 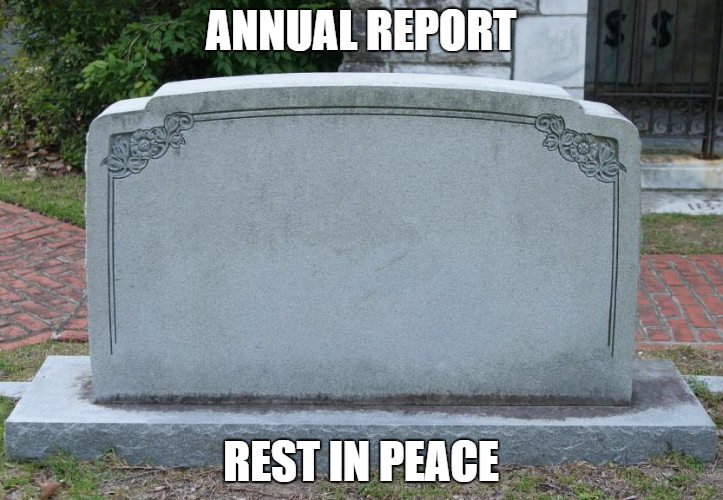 If the annual report is dead, and is not to be produced, it’s time for the nonprofit to devise — and revise — other communication vehicles to ensure that newer supporters are fully informed about the breadth and depth of programs and services. How might these communications be best achieved? Create a Get to Know XYZ as an informative one-sheet or brochure. Post the current and prior issues of the newsletter on the website (see below). Provide periodic updates to programs and success stories featured on the website. For example, in the discussion of a training course, note that a graduate, who was hired after completing an internship at a tech company, was recently promoted. Gather posts shared on Facebook and Twitter as a timeline. Keep your recent conference current. Revise notices of upcoming events upon completion by adding summaries of research, panels, results and impacts. Amplify news articles about the organization with photos, videos and updates of the latest activity. Take photos of services and programs in action, either live or staged; assemble the images in a video and add a voiceover. Aggregate the essential financial data as pie charts: income, grants and donations in the first and program, overhead and salaries in another. Finally, all these materials should be housed on the website and periodically shared on social media. Your organization has a wealth of content that is both time-sensitive and evergreen. Transform any potentially date-driven material so it is current and timeless. Added together, you conduct a periodic review of the highlights and achievements of the year, quarter or month without calling it a traditional annual report. Share your newsletter. Nearly all of the attendees at a workshop on newsletters I taught at NPCC published a newsletter. Yet 90% of them did not post it on their website. Are you hiding your newsletter from people who want to learn about your organization? Making all your newsletters available is a no-cost way to promote your group’s programs, services and successes throughout the year, regardless of publication date. Each one should have a link for readers to easily view previous issues. Also, categorize or tag them to facilitate search for a specific topic. Ready to re-format your annual report? Contact me at 212.677.5770 or email Janet@JanetLFalk.com to look beyond the calendar or fiscal year. Instead, let’s aggregate the steady flow of communications that broadcast your activities and achievements all year long.